We are proud to be a sponsor of this important event. An inspiring afternoon celebrating Minnesota’s strong and diverse community of female entrepreneurs. Women business owners drive not just the economy, but worldwide change that inspires and uplifts. Come hear their stories and celebrate new possibilities for your business. Stay afterwards and mingle, be curious, and meet other like-minded women entrepreneurial leaders in our community. 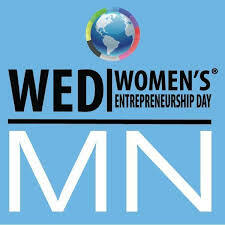 This year, Women’s Entrepreneurship Day Minnesota will focus on inspirational stories from local entrepreneurs who have companies that have taken them to the national and even global stage. On our day of “Local Inspiration - Global Impact” , we will hear from Lee Wallace of Peace Coffee, Da Bomb Bath Fizzer sister entrepreneurs Caroline and Isabel Bercaw , Quyen Balter of Turrie, and Jasmine Russell of Monicat. We will also feature a "Down To Basics" panel moderated by Alex West Steinman of the Coven featuring Maggie Knoke of Pipeline Angels/Framework Consulting, Katie Simpson, Minneapolis/St. Paul Market President for Bank of America, and Aimee Dayhoff - Litigation Shareholder, Winthrop & Weinstine. We will also hear from some fact tellers, who will bring some helpful advice and data to the day - opening with our keynote, Mary Grove, previously of Google and now at Revolution/Rise of the Rest, and we will also hear from Kweillin Ellingrud of McKinsey & Company, Amy Kern of KZ Workplace and closing speaker Shawntera Hardy, Commissioner of the Minnesota Department of Employment and Economic Development (DEED) and Co-Founder of Civic Eagle. downtown minneapolis real estate experts.